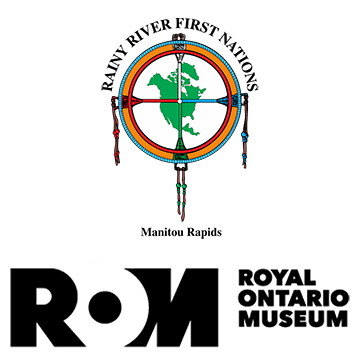 RAINY RIVER and TORONTO, November 13, 2018 – Since 2016, the community of Rainy River First Nations (RRFN) and the Royal Ontario Museum (ROM) have been engaged in a collaborative effort to return Ancestors and sacred objects that were removed from the community during excavations of burial mounds in the 1950s–1970s. The ROM recognizes their participation in these past excavations conducted by Walter Kenyon, who served as a curator at the ROM from 1956–1982. Furthermore, the ROM acknowledges that the museum presently houses Ancestors and sacred objects from RRFN, and recognizes their responsibility in facilitating their journey home. All parties acknowledge that this is a shared history and story between RRFN and the ROM, and both groups are committed to mutual learning regarding the history of archaeology, the collection and care of sacred items, and the meaningful redistribution of knowledge which will continue long after the items are returned to the community. RRFN acknowledges their position as stewards of the burial mounds located within their territory along Manidoo Ziibi (Spirit River or Rainy River), and accepts the responsibility to continue to preserve and protect the mounds and those who rest within them. Following the return, the ROM has committed to working collaboratively with RRFN to find culturally sensitive and respectful means of sharing this story, which can serve as an important educational resource to present and future generations. This project and the long-term relationship that is being forged between the ROM and RRFN are being built on a foundation of trust and transparency. Archaeology and the study of First Peoples within Canada have a history of being one-sided. It is hoped that these steps, in line with the Truth and Reconciliation Commission of Canada’s Calls to Action, will begin a healing process, which will lead to an increase in community-led projects, and the diversification of those who take part in the care of cultural collections. Rainy River First Nations is a Treaty 3 Anishinaabe community in Northwestern Ontario, and represents an amalgamation of seven historical bands that lived along Manidoo Ziibi. The community owns and operates Kay-Nah-Chi-Wah-Nung Historical Centre (KNCWN), which is home to the largest concentration of known burial mounds in North America and was designated a National Historic Site of Canada in 1970. For thousands of years, the people of RRFN have acted as caretakers of the river and those who rest along its shores. The Centre offers interpretive tours and galleries, a collections space with over 16,000 artifacts, a gift shop that showcases artwork by local Indigenous artists, and a restaurant that serves traditional Ojibway cuisine. KNCWN is an educational resource for the community, and allows Rainy River First Nations to present, preserve, and protect their traditional language, culture, and practices.